Dimensions 0.50 by 6.25 by 7 in. Amazon.com description: Product Description: Ortenzia Caviglia is an undiscovered opera understudy whose lucky break results from the mysterious murder of the reigning diva. Upon hearing her sing, Jasper Ankle becomes her deepest admirer, undaunted by perilous weather and abject poverty in his quest to hear her sing. As Ortenzia's star rises, Jasper sinks further into despair, until performer and fan collide in true Edward Gorey fashion. 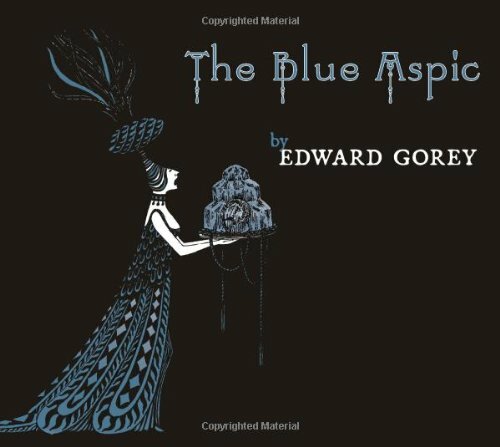 Exquisitely illustrated with Gorey's signature pen-and-ink crosshatching, The Blue Aspic is a heart-wrenching and oddly hilarious tale of unrequited love and the dangers of celebrity. About: Ortenzia Caviglia is an undiscovered opera understudy whose lucky break results from the mysterious murder of the reigning diva.